Zak Podmore is a contributor to Writers on the Range, the opinion service of High Country News. He writes in San Juan County, Utah. San Juan County is celebrating President Donald Trump’s recent decision to cut over 2 million acres from Bears Ears and Grand Staircase-Escalante national monuments in Utah. The move amounts to the largest rollback of federal land protections in U.S. history. By saying San Juan County, however, I mean the county’s conservative leadership and not the majority of its residents. Much of the county overlaps the Navajo Nation, and while polling data on reservation land is virtually nonexistent, it’s clear that not all local residents celebrate Trump’s order. In fact, 98 percent of voters in the Navajo Nation districts that straddle the Utah-Arizona line have voiced support for the protection of Bears Ears. Nonetheless, longtime county commissioner Bruce Adams assured a crowd of 250 monument opponents in Monticello, Utah, Dec. 2, that “President Trump has listened to the 15,000 people that live in San Juan County.” Not only is this a serious overestimation, it begs the question: Has the county leadership itself listened to the 15,000 people that live here, or have certain voices been silenced? Unlike Utah as a whole, white Mormons make up the minority in San Juan County, where I live and where Bears Ears is located. According to the most recent census data, the population is over 50 percent Native American. An ongoing lawsuit has determined that San Juan County is in violation of the 14th Amendment’s Equal Protection Clause and of Section 2 of the Voting Rights Act owing to its systematic discrimination against Native residents. If the judge overseeing the case rules voting districts must be redrawn — and it looks likely that he will — the county commission and school board could become majority Navajo for the first time in history. 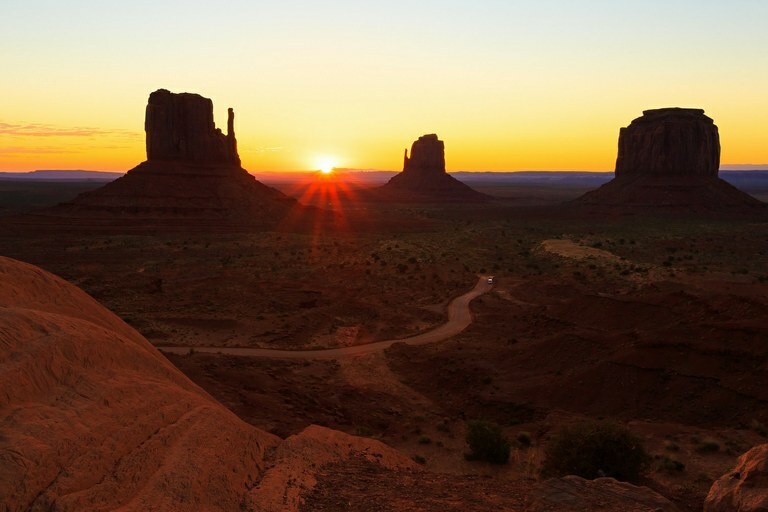 A view of Monument Valley during sunrise on the Navajo Nation. Lyman used that same word — conquered — at the Monticello celebration of the slashing of Bears Ears National Monument. No less than three times during his speech, he repeated an out-of-context line from Thomas Jefferson, warning of the day when our “children wake up homeless on the continent their fathers conquered.” Conquered from whom, Lyman didn’t say. Jefferson’s full quote is about the dangers of powerful banks, not Indigenous peoples.